Additional information is available on my blog. It has been a long winter and my worm bin is REALLY FULL... what do I do? Until soil temps warm up, you cannot take your worms to your outside compost pile and garden, so you have several choices. I think the best is to start a worm bin for a friend or local school. Make a bin for them, as shown on the Your Bin page, and give them a healthy portion of you bin contents. Alternatively, you can stop feeding for a month (freeze the scraps or try to dig them into your outdoor pile). Again, the best option is to give a friend a spring gift. Click here for instructions on harvesting your bin. If I use shredded paper, will toxins in ink (newsprint or laser printer) hurt my worms? I have been using shredded newspaper and office paper for years without problems. I did call my local paper and learned that the ink is non-toxic. I don't use glossy pages. I have never had any problems. How do I keep my worms happy? Worms love food scraps and plant waste. Worms also need bedding like shredded newspaper (¼ inch strips). Does it attract bugs? Does it smell? No and no. If you cover the newly added food with bedding and keep your bin from getting too wet inside (add extra bedding to absorb excess moisture) your worm bin will not attract bugs or smell. Will my worms get loose? No. Your worms will be happy in the bin and won’t escape if you use a bin with screens (see Your Bin). Also, check out the Basics page. Why aren't the worms eating the food I put in my bin yesterday? Worms don't eat the food directly (they don't have teeth). Instead they eat the mold and fungi that breakdown the food as it decomposes. You'll eventually notice that worms come to the part of your bin where the food has been aging for a few days. You won't usually find them in food scraps that you placed in the bin last night. This depends on how cold it gets where you are (soil temps in the bin). Vermicomposting works best at around 72°F. Your worms will be fine down to about 40°F. The decomposition process slows as temperature decreases and this means less food (see above about what they eat). Worms are simple creatures, so they breed according to space and food supply. Short spells of cold weather are OK, but sustained cold like we have in Maine will kill them. Some cocoons may survive, but you'll have a SLOW start in the spring. How many worms do I need? How big of a bin do I need? For a family of 3-5, I recommend that you use a 20-25 gallon worm bin. Start with 1-2 pounds of worms, and eventually your bin will be full of worms and compost. Start with small additions of food. Soon you can put in several pounds of food scraps per week. To get started all you need is a bin and worms. Click here for step-by-step instructions. And click here for more information on basic information. All worms are shipped bedrun. This means that your shipment contains worms of all ages & worm cocoons in worm compost and castings scooped right out of one of my bins. 1 pound orders are packed to be more than 1 pound. I have found that redworms ship better this way and establish in new bin more quickly. In addition to adolescents and adult breeders, the worm compost in your order will contain lots of young worms and cocoons that will quickly colonize your bin. There is variability between orders (some have more adults and some have more cocoons). Worm farming is FARMING, and as such subject to the natural variations in life cycle and seasonality of the worms. This is not an industrial process (I literally scoop right out of one of my bins to fill orders), so I cannot guarantee that you will receive a certain number of adults or cocoons in any order. I can guarantee that your redworm order will colonize your bin. I have testimonials from previous purchasers that I can provide upon request. The worms I ship should not be compared to what you would get if you purchased worms for fishing bait. The worms I ship are for colonizing worm bins. All worms are shipped bedrun. This means that your shipment contains worms of all ages & worm cocoons in worm compost and castings scooped right out of one of my bins. One-pound orders are packed to be more than one pound. I have found that redworms ship better this way and establish in new bin more quickly. In addition to adolescents and adult breeders, the worm compost in your order will contain lots of young worms and cocoons that will quickly colonize your bin. There is variability between orders (some have more adults and some have more cocoons). Worm farming is FARMING, and as such subject to the natural variations in life cycle and seasonality of the worms. This is not an industrial process (I literally scoop right out of one of my bins to fill orders), so I cannot guarantee that you will receive a certain number of adults or cocoons in any order. I can guarantee that your redworm order will colonize your bin. I have testimonialsFeedback from previous purchasers that I can provide upon request. The worms I ship should not be compared to what you would get if you purchased worms for fishing bait. The worms I ship are for colonizing worm bins. Where can I get the items you mention in your blog and your presentations? If you need vermicomposting supplies, you can purchase from my Recommended Vermicomposting Supplies page on Amazon. Worm tea is a nutrient-rich liquid fertilizer made from worm castings. It may be poured onto the soil, applied by spraying the leaves of the plant, or both. If you choose to spray the leaves, do so in the morning when plants are most receptive to this form of feeding. If you apply worm tea when you water, the nutrients filter down into the soil to the roots of your plants where they are readily absorbed. Do not store the tea in a closed container. Those microbes are alive! It will build up pressure, and may blow the lid off. Check out my full page about worm tea. What can I do about fruit flies? Fruit flies can be a real problem in the worm bin (not that they're bad for composting), but they are annoying to have in your home. If you follow these steps you will be free of fruit flies in a few weeks. Worm compost is great fertilizer for indoors and outdoors. 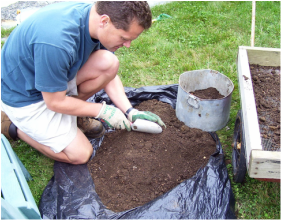 Use worm compost directly as soil amendment, side dressing, or to make liquid vermicompost tea (worm tea). Vermicompost tea is a filtered solution of your finished vermicompost. If you have worms, you can make your own worm compost and tea. 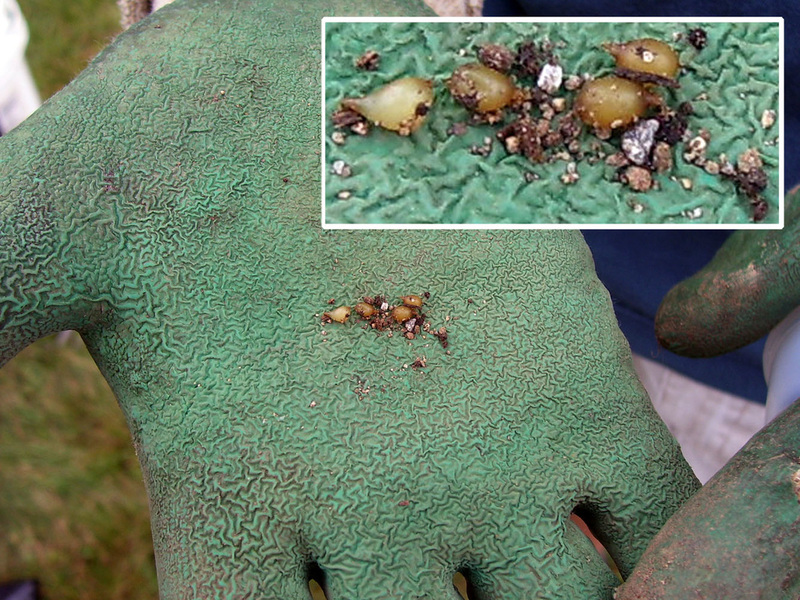 What do redworm cocoons look like? 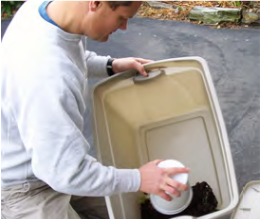 What makes a good worm bin? Any container that breathes and keeps the worms inside can be used. A box made of wood or a plastic box with air holes work well. I find that a 15-25 gallon plastic storage box works well for a typical family of 3-5 people. 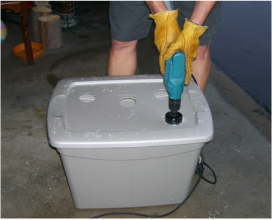 See my instructions to make your own worm bin. (this is an Adobe Acrobat PDF file). Anything that you have on hand that is organic and absorbs moisture will work. Some that I've tried and work well are shredded newspaper, cocoa husks, coconut coir, and peat. I understand that using peat is controversial (see alternatives to peat), but I'm listing it here because it does work. ​Are redworms native to New England and will they harm natural environments? Like many things in nature, nothing is as simple as all good or all bad: earthworms can harm some environments. The earthworm's ability to tunnel through the soil and make passageways for air and water, to decompose organic material and release its nutrients, and essentially "till" the soil is good news for farmers and gardeners who are growing crops that are continually replanted, and where the soil is continually amended. Earthworms essentially prepare the soil for us. However, in forest ecosystems earthworms rapidly decompose the spongy layer of leaves and plant matter that makes up the forest floor. This duff layer is essential to understory development (tree seedlings, wildflowers, ferns, etc.). Earthworms consume the duff faster than nature can replace it, leaving little to support and nourish the rich native plant life. Invasive plants, being opportunists, are moving in. The underlying (no pun intended) problem is that earthworms are not native to most northern parts of the country, including New England. Earthworms in this area were killed by the last ice age. The earthworms in your garden are species from Europe that may have arrived with the Colonists (in soil used as ship ballast or with plants) or may have been introduced more recently by fishermen dumping their bait in the woods or gardeners spreading compost or mulch, especially worm castings on the edge of their property abutting woods. Redworms or red wigglers, commonly used for worm composting, are not native; however, they are not hardy in northern climes and probably won't survive our long Maine winter. Nevertheless, we should use good worm management to limit the potential for a problem. The University of Minnesota, which has been a leader in researching and spreading awareness of the problem, has some recommendations (and lots of helpful info) in their Great Lakes Worm Watch. WormMainea is a small hobbyist venture (certainly not a business!). WormMainea is located in Scarborough, Maine. My mission is to educate people about the benefits of worm composting and provide information and resources to get people off to a good start with their own bins.